Improperly performed situps or doing too many situps before the lower back is sufficiently developed can indeed cause back pain. One common method of the exercise involves placing feet under a bar to make it easier to complete a situp. However, this exacerbates the potential for back pain because by anchoring the feet and placing abnormally hard pressure on hip flexors, the spine is forced into an anterior pelvic tilt that could damage discs or strain ligaments. Back pain from situps is also possible because of pre-existing conditions that emerge during situps. During situps, many people place clasped hands behind their head or neck to help raise the upper body and prevent neck muscles from fatigue. However, this action may encourage back pain by causing cervical flexors located in the neck to shift pressure to lower-body muscles. Then, as abs strengthen and neck muscles weaken, an imbalance in muscle power occurs, potentially provoking back pain during an extended session of situps. Try crossing your arms over your chest to prevent this. Because situps involve muscles surrounding the spine, mechanical problems may occur that cause back pain, including muscle tension, spasms, sprains and ruptured discs, also known as herniated discs. Sprains from situps happen when they are performed improperly and the back is twisted or raised aberrantly. 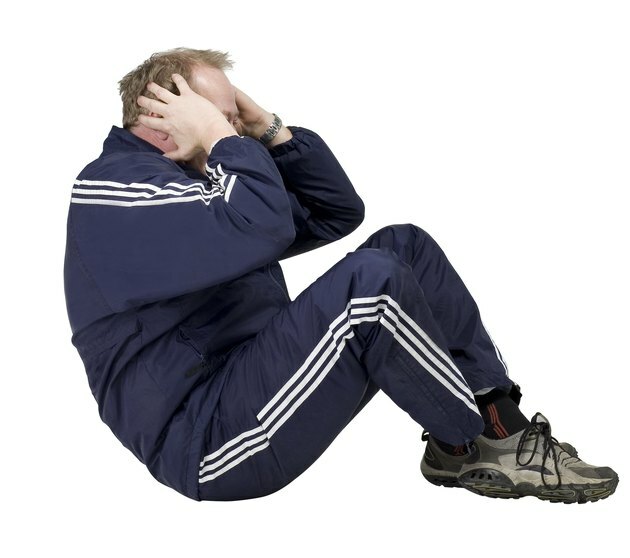 Spasms and painful tension emerge when someone overexerts the back during situps by doing too many of them too quickly. Muscles rebel by tearing and becoming inflamed when fatigued caused by irritated and breached nerve endings. If you've tried to improve your form or changed your situp routine but still experience pain, there are other things you can try. Experiencing back pain during situps is frequently a consequence of performing this exercise on the hard ground. When doing situps on a hard platform, the spine is pushed against the ground as the hip flexors and abdomen muscles raise the upper body and extend the spine, placing pressure on the lower part of the spine. Try doing situps on a pad, carpet or other supportive surface that provides some flexibility rather than rigidity. Another way to perform situps without aggravating the lower back is to lie in bed and elevate your legs slightly by propping them up on bedding.